Sustaxyl – anabolic and androgenic steroid from the Indian pharmaceutical company Kalpa Pharmaceuticals. The product is a blend of testosterone. Injectable preparation sold in vials of 10 ml (350 mg/ml). Testosterone mix first appeared on the market as a means of hormone replacement therapy, which has been used to restore the secretion of the appropriate hormone. It was produced by Organon company. Sustaxyl from Kalpa Pharmaceuticals put Testosterone on esters with different side chain length. This provides a prolonged action of the drug. The structure of the steroid include: testosterone propionate, testosterone phenylpropionate, testosterone decanoate and testosterone isocaproate. First, in the blood is entering propionate, and operates about 2 days, then starts phenylpropionate (approximately 1 week), followed by – isocaproate (week and a half), and the latter comes into action – decanoate, a complete breakdown which occurs during the month, and even more. Of course, overlapping injections are made, it allows you to maintain hormone levels at a constant level. Sustaxyl’s undoubted advantage is the reduced number of injections. The drug does not cause pain and the formation of “lumps” in the place of injection. Perhaps the main drawback of a mixture of testosterone is a big cost, while the anabolic properties of the mix does not differ from the isolated form. Increased muscle mass. 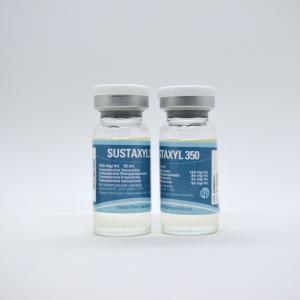 Sustaxyl admission is accompanied by a significant increase in muscle mass. During the month course of medication an athlete can gain up to 6 kg. Anti-catabolic effect. 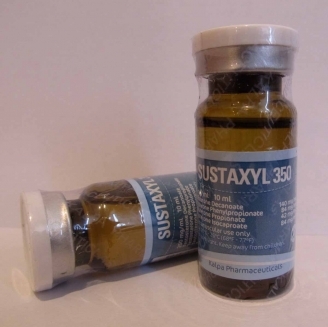 Sustaxyl inhibits muscle breakdown and accelerates recovery processes. Increased red blood cell production. The increase in red cell blood can increase the athlete’s anaerobic threshold. This feature is particularly appreciated by athletes and skiers. Using Sustaxyl by professional athletes is only possible in the preparation or recovery periods. Detection time of steroid at doping-control – 3 months. Sustaxyl cycle is not recommended for minors or athletes who have at least some contraindications. Before you start taking the medication is best to consult with a sports doctor. The average duration – one and a half or two months. Weekly dosage ranges from 250 to 500 milligrams, injections performed every seven days. On cycles longer than 2 months, it is recommended the use of human chorionic gonadotropin. Also, from the second week you must take aromatase inhibitors, simultaneously controlling the level of estrogen in the blood. The boosters or other stimulants (such as Tribulus) are accepted as a post-cycle therapy to restore endogenous testosterone secretion. The hormone is normalized after about 3-4 weeks. To increase the efficiency of the Sustaxyl reception, it is recommended diet and supplement the diet with vitamin-mineral complexes. Testosterone Suspension – quite powerful steroid, in itself provide a pronounced effect. But if you want even more, the information on how to take Sustaxyl with other AAS would be useful to you. Correctly composed combined cycle can not only get a synergistic effect, but also greatly reduce the risk of side effects. 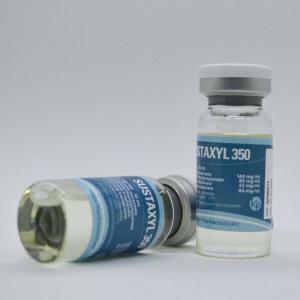 Most often Sustaxyl, for a set of muscle mass is combined with Nandrolone, and during the “drying” – with Winstrol. The reactions of the organism to the mixed testosterones is indistinguishable from reactions to isolated forms of testosterone. There may be estrogen side effects from Sustaxyl as increased body fat, edema, gynecomastia, and significant suppression of testosterone. To avoid these negative reactions must be applied antiestrogens, but best are aromatase inhibitors. Using a selective estrogen receptor modulator is only suitable as a PCT. Most satisfied athletes are with the quality of to gain muscle mass. However, the ability of the steroid to effectively burn body fat is often called into question. Sustaxyl reviews often contain complaints about the allegedly weak stimulation of reduction of fat cells and a significant rollback phenomenon. However, athletes, point usability of the drug, its safety and lack of any skin reactions at the injection site. 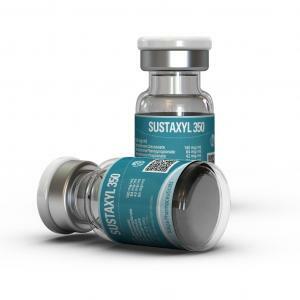 Sustaxyl reviews show the effectiveness of the combination with the steroid Nandrolone and Winstrol.